This species was formally considered part of Pseudonaja nuchalis. 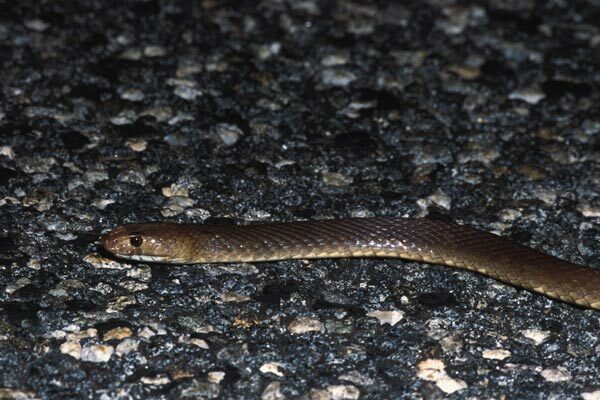 An hour or so after I was entertained by the bad mood of a King Brown Snake, I came across another angry elapid on the highway. This one was smaller, perhaps four feet long, but no more cooperative. I followed it around at a safe distance for a good ten minutes hoping that it would eventually pause photogenically, but it never really did for more than an instant. 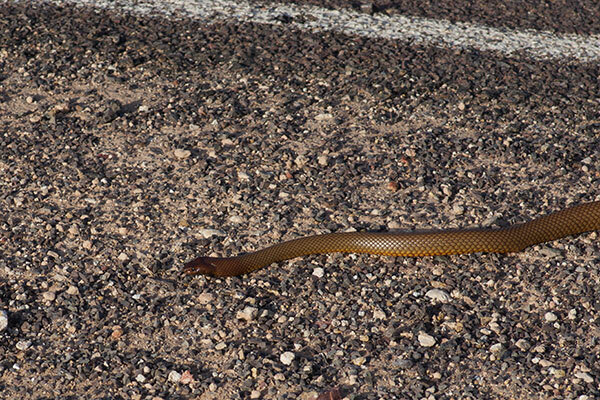 For a long while I assumed that the two snakes were the same species, but upon close examination of the photos and comparison with photos from various other sources, and with a suggestion from Australian ecologist Mark Sanders, I eventually concluded that the first snake was a King Brown and the second a Western Brown. 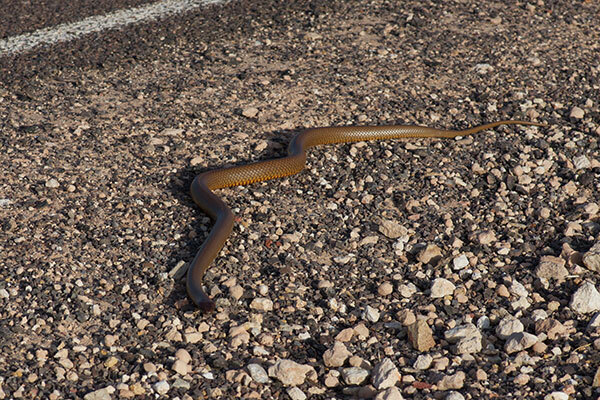 While driving south to Jurien, we passed over a yellowish broad-banded snake in the road, between two and three feet long. Nobody recognized it as a snake until it was too late to stop, and there wasn't a good place to pull over for another couple of turns in the twisty road. Finally we did stop, leapt out of the car, and ran back in search of our snake. Fortunately, we hadn't hit it. Unfortunately, it had disappeared. The only snake meeting that description in this area is Pseudonaja mengdeni, so that must have been what we saw. I had already seen my first mainland Dugite and my third Thorny Devil earlier in the afternoon, so I was in a fine mood as I headed back toward Kimba for dinner. And then, what should I see in the road but another large snake, and a species I hadn't yet seen on this trip! Yay!